When I think about Florida food, I think of either tropical fruit or rock-hard January tomatoes. But a new book shows that the eat-local movement and artisan food products are as strong in Florida as in other parts of the country. “Field to Feast: Recipes Celebrating Florida Farmers, Chefs and Artisans” by Pam Brandon, Katie Farmand and Heather McPherson (University Press of Florida, $28) offers stories of small farms, creative producers and innovative chefs, with recipes from all three camps. Most of the recipes are simple and highlight the ingredients. While a few might be difficult to prepare outside of the Sunshine State – a ceviche that calls for a tropical fruit called longan, for example – the majority of recipes use produce found everywhere. Several use kale, recently proclaimed a “superfood,” and of interest these days. One uses the green as the base for a pesto and another a spicy-sweet version using balsamic vinegar that I will have to try. If I can’t find sugarcane skewers, I’ll just do the scallops with lime, mint and rum without them – they sound great either way. Handed-down family recipes are like patchwork quilts. They contain little pieces of everyone who has cooked them, their tweaks and additions or subtractions, but still make a beautiful whole. Marcia Townsend of Raleigh told me that her winning dish for the cornmeal cook-off at Yates Mill in Raleigh is one of those creations that started with an old recipe, then she added her own touches. 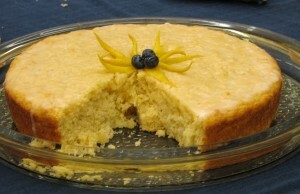 In this case, she increased the amount of cornmeal, which gave the cake extra texture. The contest was held as part of the harvest celebration at the restored mill, which is more than 250 years old. The mill works, and produces some mighty fine cornmeal. Preheat the oven to 350 degrees. Butter a 9-inch cake pan. Combine flour, cornmeal, sugar, baking powder and salt, then whisk to blend. In a separate bowl, combine buttermilk, eggs, lemon peel, vanilla and butter. Whisk to combine. Use a spatula to gently fold the liquid mixture into the dry mixture until just blended; do not stir. Place batter into prepared pan and bake for 30 minutes. Invert the cake immediately onto a cooling rack and invert once again to a serving plate so that the cake is right side up. Combine the Glaze ingredients until smooth. Drop by tablespoons full onto the top of the cake and spread until it is 1/2 inch from the edges of the cake. We’ve all seen how the soothing mantle of a good meal can foster peace among feuding relatives. 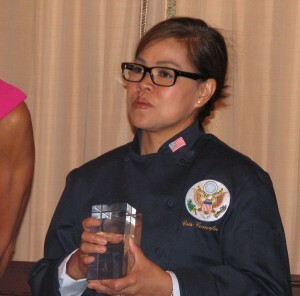 Now the U.S. State Department has created the Diplomatic Culinary Partnership, which I learned about during the recent Association of Food Journalists conference in Washington, D.C. Chapel Hill chef Andrea Reusing of Lantern is among the 90 who will take part. Reusing will be part of the American Chef Corps, a volunteer network of chefs around the country. Details are still being worked out, but their jobs could include being tapped to prepare state dinners, promoting American cooking and products, or working with international visitors. 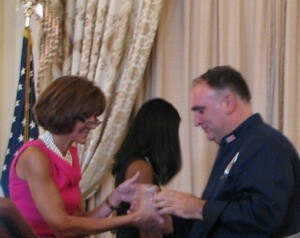 The corps includes such big names as Jose Andres, Rick Bayless, John Besh, Marcus Samuelsson and Susan Spicer. For state dinners, the corps takes us another step away from the traditional French food served for years to menus that reflect America’s bounty and other traditions, often tailored to the dignitaries being honored. One example: Ming Tsai’s meal for the Chinese vice president, which incorporated influences from both countries. After they participate in some way, corps members will receive special navy State Chef jackets, with an American flag and the State Department seal, after participating in some way.